UFAI's Dr. Baravarian discussing the new treatment which offers joint flexibility for those suffering from toe arthritis. Dr. Baravarian on ABC News discussing the high-frequency ultrasound that is now treating heel pain. 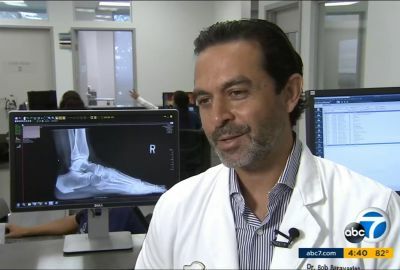 UFAI Featured on NBC's "The Doctors"
Dr. Baravarian on NBC's TV show "The Doctors" explains plantar fasciitis and performs 3 advanced treatments before a live studio audience. The IV League brings together top medical experts and surgeons in their respective fields. This episode involves a pregnant patient that is in need of tarsal tunnel syndrome surgery. UFAI on Hallmark Channel's "Home & Family TV"
Dr. Baravarian is featured on Hallmark channel's "Home & Family TV" discussing causes and treatment options for bunions. UFAI on Hallmark's "Home & Family TV"
In this episode of "Home & Family TV" Dr. Baravarian explains causes of neuromas and treatment options available at UFAI. UFAI Featured on "Home & Family TV"
Dr. Baravarian discusses heel pain and plantar fasciitis: what causes it and advanced treatment options. "Home & Family TV" featuring Dr. Baravarian discussing advanced treatment options for flat feet.